I am always so excited when I get to read a new Colleen Hoover book. I’m so anxious to see what she’s going to do to my heart. From the very first sentence I knew I was going to like Merit. From the second one, I knew this family was going to be different. So I orderd pizza for the kids and I settled in to spend the evening reading. Best night of my year. 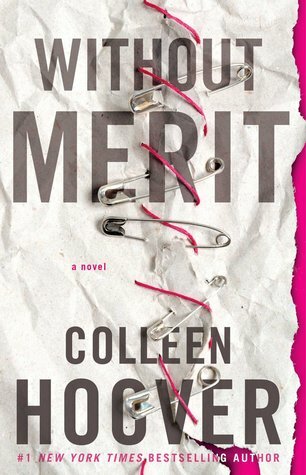 Without Merit is a story about a girl who keeps all the many secrets of her family. She hates it but she does it. But everyone has their breaking point, and when Merit reaches hers, the Voss family won’t know what hit them. After the emotional book, It Ends With Us, Colleen switched gears and went back to her Slammed roots and gave us this fabulous story. This is a book that I recommend you read along with your teens. It deals with some tough and very poignant issues that many of them, and us, face today. I personally, will be having my kids read this. In fact, this will be their first CoHo book and I’m rather excited over this fact. While they may not have to deal with many of the issues being faced in this book, they may find that Merit is just like them. This story is a mass bundle of quirkiness and emotion. I was drawn in by the over the top idiosyncrasies of each member under the Dollar Voss roof. I wish I knew this family. They’re as unique as their names. I don’t wanna say anymore, because you need to just dive in and immerse yourself in this world. Colleen, thank you for writing a story that hit me right where I needed to be hit. Thank you for giving me lots to think about in my children’s and my own life. You bury me.